Though built to be a hard worker if needed the Bernese Mountain Dog is a big, cuddly teddy bear of a dog with a usually placid temper and affectionate nature. They are playful, always up for a game and great guard dogs to boot. Because they are a larger breed dog - the average Bernese Mountain Dog stands between 23 and 27 inches tall, and can weigh around 80 to 100 lbs, it is essential that they get the right nutrition, in the right amounts, at all times. But as there are so many options to choose from how does a Bernese pet parent decide which is the right one? To help you make the right choices for your pooch here is a look at some of the best food for Bernese Mountain Dogs, based on both our experience and online reviews and opinions from Bernese Mountain Dog pet parents and breeders. First Five Ingredients: Deboned lamb, lamb meal, whole lentils, whole peas, lamb liver. ACANA Lamb & Apple Singles Formula Dry Dog Food features grass-fed lamb as the sole animal protein and is a limited ingredient recipe that’s perfectly suited for sensitive dogs of all breeds and life stages. Infusions of freeze-dried lamb liver naturally enhances palatability - great for picky eaters. It contains 409 calories per cup, has 31% crude proteins, 17% crude fats and 6% crude fiber. The kibble is the size between a penny/dime. We particularly like that this recipe is made up of 60% grass-fed lamb and 50% fruits, veggies and other fresh botanicals (turmeric and chicory root). As mentioned it is a limited ingredient low-glycemic formula with limited carbs that's perfectly suited to dogs with allergy issues. It contains no grain, soy, wheat, potato, tapioca, rice, glutens or other plant protein concentrates. The fresh and raw lamb meat, organs and cartilage used in the recipe - is nourishing protein and healthy fats - which provides your Bernese Mountain dog with the essential amino acids, vitamins and minerals he/she needs. It also contains glucosamine (500 mg/kg) and a ratio of calcium to phosphorus of 1.5:1.1 - which is the recommended amount for this large breed dog. If you're looking for grain-free dry food that's palatable even for the pickiest dog that doesn't add any grains, chicken flavoring, additives, fillers - Acana comes highly recommended! This high end food is a little pricey but worth the price jump if you can afford it. Bernese Dog Mountain owner review: "I have a 3 year old Bernese Mountain Dog and a 1 year old Bernese Mountain Dog and they absolutely love this food! It has whole foods and no extra fillers or anything fake. They both have a shiny coat and lots of energy! We are Acana fans for sure!!" First Five Ingredients: Deboned Turkey, Turkey Meal, Chicken Meal, Peas, Potatoes. 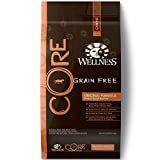 Wellness offers a number of different high quality dog food formulas for pups of all shapes and sizes, but the CORE line differs as it is protein rich and nutrient dense and offers the extra nutritional elements dogs need to remain well fed and healthy. The original formula is designed for all dog breeds and it's main sources of protein – deboned turkey, turkey meal and chicken meal offers a protein content percentage of 34%, a figure that is higher than many other kibbles. Larger dogs do need more protein than their smaller counterparts, to help support their larger frames and the level offered by this dog food formula would be considered optimal. To provide a good selection of antioxidant vitamins the formula includes blueberries and apples, kale, complex carbs and Omega 3 fatty acids - essential for coat, eye, brain and joint health, are provided by the addition of salmon oil and flaxseed. The CORE formula is also supplemented with additional vitamins and minerals such as Vitamin D3, B12 and C, Niacin, Riboflavin and glucosamine and chondroitin, which are essential for joint health. Pet parents who have chosen this food for their pup frequently praise it for the quality of the ingredients and the fact that even pickier eaters seem to enjoy the taste. Others like the fact that the glucosamine (250g) and chondroitin (200g) content is high enough that a separate supplement is not required, and almost all of the positive reviews - of which there are many - praise it for its reasonable pricing when compared to some other large breed dog foods. This recipe is a great alternative to our top recommendation. 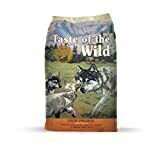 Bernese Mountain owner review: My golden retriever AND fussy eater Bernese mountain dog both love this food. Their coats and overall health is great and I wouldn’t be surprised if it is because of this food. This is one of the most popular large breed puppy food formulas available online of all, and for some very good reasons. The main proteins in the formula, buffalo and bison, are an unusual choice for a dog food formula, but these leaner than standard beef red meats offer a great deal of high quality proteins without unnecessary 'bad fats'. This recipe contains 28% crude proteins, 17% crude fats and 5% crude fats, with 370 kcal/cup. Essential antioxidant vitamins are provided by the addition of blueberries, raspberries and tomatoes and Omega 3 and Omega 6 fatty acids are provided by salmon oil and flaxseed. As it is designed for a growing large puppy the formula is also supplemented with folic acid and DHA, both of which support brain and muscle development. The many positive reviews online often mention how easily digestible it is, especially for puppies who have had issues with tummy upsets when given other formulas. The apparent great flavor is also mentioned often, as well as the fact that many pet parents feel that it improves the condition of their pups coat and skin noticeably. First Five Ingredients: Beef, Chicken, Beef Broth, Beef Liver, Flaxseed. Like most dogs, Bernese Mountain Dogs do enjoy variety in their diet in the form of a mixture of wet and dry dog foods. Dave’s 95% Premium Meats Canned Dog Food is specially formulated for dogs that are overweight or diabetic. But it's ingredients also makes it a great inexpensive alternative to a raw diet - if you want to feed your Bernese Mountain Dog raw food. It features quality protein meats with just water, vitamins, and minerals - and dogs love the taste! The formula is also supplemented with a ton of vitamins, minerals and amino acids including vit. D3, A and B12, Biotin and Calcium . Crude proteins are 9.5%, crude fats 7.5% min and crude fiber is 1.0%. The calorie content is 441 kcal/can. The primary proteins included in this formula are beef, chicken and beef liver - lots of meat! These lean meats offer the right amounts of high quality proteins, and Flaxseed offers the additional benefit of being one of the best food sources of Omega 3 fatty acids of all. There are no carbs in this formula, no grains, no cereals, no artificial colors or flavors! We highly recommend this grain-free wet food for your Bernese dog, especially if he is overweight or you prefer a raw diet for your pup. Just feed less dry food and add Dave’s 95% Pet Food. It's also incredibly affordable quality pet food. As larger dogs, some Bernese Mountain Dogs are predisposed to developing joint issues as they age. Their larger mass can lead to arthritis at an earlier age than some pups and, although responsible breeders do screen for the condition, hip dysplasia, a condition in which the ball and socket joint in the hip is malformed is seen in some Bernese. Skin and coat issues are also something that can easily affect the heavy coated Bernese Mountain Dog and so it is essential that their diet includes skin and coat enhancing ingredients like Omega 3 and Omega 6 fatty acids. As they are larger dogs, Bernese Mountain Dogs should be fed a diet that meets their nutritional needs while not adding too much fat or too many extra calories, as some larger dogs are prone to obesity in their later years as they slow down if their caloric intake is not monitored carefully. 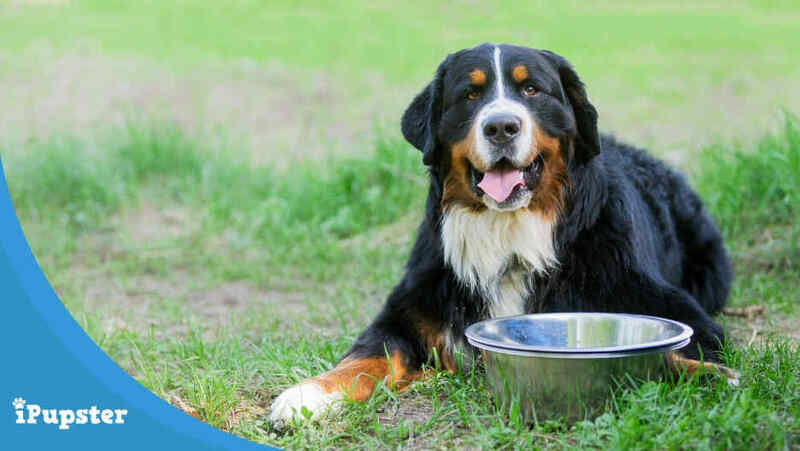 Most breeders, vets and handlers recommend that dry food only be fed to Bernese Mountain Dogs, unless there are special health considerations. Usually less expensive brands have more fillers in their top five ingredients such as corn, wheat gluten or other cereals. Fillers while they have have no nutritional value can also lead to gas, diarrhea, constipation and other gastrointestinal problems in your Bernese Mountain dog. The recommended protein levels is at least 21% for inactive pups and at least 26% for active Bernese Mountain Dogs. Each type and brand of food will indicate on the bag or how much to feed your Bernese Mountain Dog. Dry kibble will indicate a cup measure based on the body weight of your dog. Dog trainers that work with Bernese Mountain Dogs recommend that these dogs have access to their food for 15-20 mins blocks in the day in addition to fresh and clean water at all times. So that's two medium sized portions. If your dog is prone to bloat, then split it into several smaller meals. Bernese Mountain puppies require 3-4 feedings per day. Setting a feeding schedule for your puppy is recommended for housetraining and to ensure there are no accidents. The general advise is to feed them at least an hour before leaving them alone in the house. Feed them, let them relax and then take them out for a short walk. They generally need to go outside to do their business 20-30 mins after a feed. The general wisdom is that a larger dog like the Bernese Mountain Dog needs around 30 calories per pound of body weight. As they can weigh up to 100 pounds that equals around 3,000 calories a day, more in fact, than the average human. The recommended Bernese Mountain Dogs weight falls within the large size range with females weighing in between 55 - 73 lbs. and males weighing between 77 - 95 lbs. Large dogs need more protein than their smaller counterparts to help them maintain the health of their lean muscle mass. They also benefit from a diet that is lower in fat for the same reason, as well as to prevent unnecessary weight gain. Both underweight and overweight Bernese Mountain Dog are prone to developing heart and respiratory conditions, as well as joint and muscle pains and arthritis. So, the general advise is to keep your Bernese Mountain dog at a healthy weight throughout their lives and into their senior years. Once they are adults, a Bernese Mountain Dog will also benefit from being given a dog food formula that is supplemented with Glucosamine and Chondroitin, as these minerals are believed to improve joint health and to help protect against a loss of movement due to arthritis and other age related joint conditions which larger dogs are prone to. Finally, Omega 3 and Omega 6 fatty acids are beneficial when added to the diets of Bernese Mountain Dogs of all ages, as these amino acids help maintain the shine and lustre of their beautiful thick coats while also offering brain and joint health benefits. With a premium dog food, there won't be any need for additional vitamin supplements for your Bernese Mountain Dog unless instructed by your vet. Nourishing your Bernese Mountain Dog with a properly balanced diet of quality meat and vegetables is one way a pet parent can ensure their dog remains healthy and in the best possible condition well into their senior years. Regardless of the brand of food or diet you choose, be sure your Bernese Mountain Dog is in great physical shape and healthy overall. If you're in doubt ask your vet for recommendations on the best diet for your Bernese Mountain Dog. The Complete Guide to Bernese Mountain Dogs by Dennis Frankel.